It's John and Lyla's wedding day, but their honeymoon is doomed to be a short one. A US Senator has been taken hostage in a Kasnian hospital and Amanda Waller wants to send in The Suicide Squad. Naturally spending more time in the company of Floyd Lawton is the last thing John wants during what was meant to be a romantic weekend but at least he can enjoy watching Lawton squirm as Cupid decides that Deadshot is her new boyfriend. Back in Starling City, Ray Palmer has turned his considerable fortunes and talents toward tracking down The Arrow following the allegations that Starling City's vigilante is killing once again. Can Oliver evade The Atom or persuade him he truly is being framed? And where will Felicity's loyalties fall if push comes to shove? The film American Sniper (Floyd Lawton's background before becoming an assassin), The John Ostrander run on Suicide Squad (a plot involving a corrupt senator named Joseph Cray), the New 52 Suicide Squad (Deadshot unwittingly attracting a mentally unstable female teammate and his uncharacteristic heroic sacrifice) and the Mike Grell run on Green Arrow (law enforcement turning on Oliver Queen after he is framed for a crime he didn't commit). So did Ollie just forget about the tasered-into-unconsciousness Arsenal following his fight with The Atom as he spun around and walked off dramatically? Michael Rowe is given a wonderful episode to go out on as Deadshot. The background for this variant of Floyd Lawton is unique to the Arrow universe and it is to Rowe's credit that - despite everything we've seen Lawton do before this episode - he successfully turns Lawton into a likeable anti-hero, if not a tragic hero. 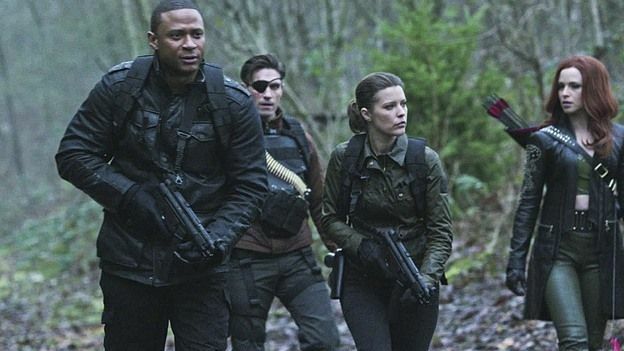 David Ramsey always excels when he is given a chance to take the spotlight for an episode. This episode is no exception. Brandon Routh does something nearly impossible in this episode - play a heroic character who we have to see as a villain. Ray Palmer's heart is in the right place and he and Oliver Queen have a lot more in common than he thinks. Ironically, it is the traits he shares with Ollie - a desire for justice and a stubborn certainty in his own righteousness - that set them at odds with one another. The script for this episode balances two complex plots with equal ease, both of them centering around the season's continuing theme of identity and the conflict between differing aspects of the self - chiefly the desire to do risk one's life doing good versus the desire to settle down with loved ones. The fight scene between Oliver and multiple dopplegangers is well shot. The effects work for the scenes with The ATOM suit are brilliant. A friend of Lyla's named Rick was meant to officiate the wedding, but we are told he was sent overseas to the South Sudan. This could be a reference to Col. Rick Flagg Jr. - the leader of Task Force X - who led two different versions of The Suicide Squad in the comics. Thea Queen is seen at the wedding, but doesn't have any spoken dialogue in this episode. Senator Joseph Cray was a villain the the John Ostrander run on Suicide Squad. A corrupt senator who used the squad for his own ends, he threatened to reveal the team's existence to the world. He was killed by Deadshot who, having been given orders to stop Col. Rick Flagg from killing the Senator, satisfied the orders by killing Senator Cray himself. Interestingly enough, given that the other major plot of this issue involves The Atom, Senator Joseph Cray's son Adam Cray briefly took on the identity of The Atom in the comics. This new Atom was recruited by Ray Palmer as a replacement and joined The Suicide Squad while Ray Palmer secretly took on another identity in order to infiltrate a gang of size-changing criminals called The Micro Squad. The country where Senator Cray is taken hostage is called Kaznnia with a z in the hearing-impaired subtitles for the episode but the caption on the establishing shot spells it Kasnia with an s.
Both spellings have been used in materials on-line relating to the fictional nation, which was originally created for the DC Comics Television Animated Universe and the nation featured in several episodes of Superman: The Animated Series, Justice League, Justice League Unlimited and Batman Beyond. It is a Balkan nation, which was nearly conquered by Vandal Savage in the modern day. In an interview, Deadshot actor Michael Rowe confirmed that the Deadshot/Cupid flirtation was a nod to the similar relationship between Harley Quinn and Deadshot in the New 52 Suicide Squad. The background given for Floyd Lawton in this episode is unique to The Arrow universe. No version of Floyd Lawton in the comics is an ex-soldier. Here, Floyd is an sniper who came home with a severe case of PTSD, turned to drinking heavily and became violent. This led to him being arrested, his wife getting a restraining order against him and Lawton being recruited as an assassin for a group called HIVE. Floyd Lawton's ex-wife in the comics is named Susan Lawton. His wife on the show is credited on IMDB as Susie Lawton. In the comics, Susie Lawton was not the mother of Floyd's daughter Zoe. Zoe was Floyd's daughter by a woman named Michelle, who was introduced in the 2005 Deadshot miniseries. There are a few references to Brandon Routh's portrayal of Superman in Superman Returns. When he offers his evidence that Oliver Queen is The Arrow to Laurel Lance, she scoffs at his "x-ray vision". And when Oliver and Ray meet in Ray's office, Oliver addresses him as "Super Suit." The Atom confronts Arrow and Arsenal at the Meltzer Power Plant. This is named in honor of writer Brad Meltzer, who wrote the Green Arrow storyline The Archer's Quest. The episode ends with a message directing viewers to The Wounded Warrior Project. Ray Palmer is able to confirm Oliver Queen is The Arrow from a distance using Felicity's face identification software and a high spectrum portable radiograph (a.k.a. x-ray machine). Lyla: You really want to do this? John: Hell yes! Do you? Lyla: Even more than the first time. John: Good. Because I'm not letting you get away from me this time. Lyla: I'm holding you to that. John: Good. I love you, Lyla. There's no dialogue as such, but there is an amusing moment when Felicity, John and Roy all have their phones go off when a news article about The Arrow starting to kill again goes on-line in the middle of the reception. Lawton: Love is a bullet in the brain and if you believe any different you're as crazy as she (Cupid) is. Ray: Oliver Queen is the Arrow. Felicity: (trying to sound confused and failing) Whaaaat? Ray: I have a 140 IQ and three PhD's. It's pretty hard to insult my intelligence but I think you just did. Felicity: Oliver's not a killer. Ray: This isn't the first time he's been judge, jury and executioner. Felicity: He hasn't killed anyone in two years. Ray: That really is not your best argument. Felicity: (tearful) He knows. God, he knows. Last year, Ray's fiancee was killed by Mirakuru men. And now he wants to protect the city. So he built a suit out of military grade technology. And he wants to put you in jail. So he used my software to track you down and he scanned you with his X-Rays. And now he knows that you're The Arrow. And he's going to tell the cops. Ollie: Palmer knows I'm The Arrow? Ollie: And he has his own mission to protect the city? Ollie: When were you going to tell me this?! Felicity: I have been getting a lot of that today. Look, it's not important. Here's what is - he's going to tell the police who you are! Roy: Ray built a super-suit? That's kind of awesome. Cupid: Baby, does it hurt bad? You were SO brave! Lawton: Okay. I take it back. I think I DO want to die. Ray: I prefer The Atom. HIVE Drone: People like you don't get to have a love, children, families. These are just distractions to people like you. For people like you, love is a bullet in the brain. Felicity: How did it go with Ray? Ollie: Not well. Your new boyfriend is stubborn. Once he's made his mind up, that's the end of it. Felicity: Sound like anybody we know? Ollie: Not only is he untrained, he's unstable. Ollie: Yeah! Yes! Yes, he's unstable, Felicity. Because he's flying around, in a weapon, looking for a man that has already killed eight people. He's going to be next. Felicity: (muttered) You'd like that, wouldn't you? Felicity: You never wanted me to be with him. Felicity: Yes it is. All that talk about wanting me to be happy was just talk. Ollie: No, I meant what I said. Right up to the point where I found out he is just like me. You deserve better. Felicity: What I deserve is to be with someone who isn't afraid of being happy. Ray told me wanted a true partner. In his work. And his mission. And in his life. Ray wants to be a hero AND a human being! Ollie: Yes, because he hasn't realized yet that he can't be. I told you that I couldn't be with you and save this city. Neither can Ray. He's just too new at this to know that. The Arrow: The man you think I am... he'd kill you here and now. I told you to back off! And you didn't listen! The Atom: So kill me. Go ahead. Show Felicity the kind of man you really are. The Arrow: I have nothing to prove to her. But you do. The Arrow: She chose you. So trust her. Senator Cray: The Suicide Squad? Well, you are true to your name if you think that the three of you think you can just shoot your way in here.... wait... there were four of you! Cupid: Floyd, what about you, baby? How are you getting out? John: Lawton, what are you talking about? That wasn't part of the plan! You said you could find your way down! Lawton: Yeah, I lied. Someone needs to cover your escape. Me up here is what gets you out down there alive. Lawton: You and your new wife. You just get back to your baby girl, alright John? Ollie comments that it had been five months since he saw Ray Palmer and now they've seen each other twice in as many weeks. This is a reference to their first meeting in 301 and their meeting last week in 316. Ray Palmer is a registered minister. He says it is a long story why. Laurel's arm is in a cast, per her training with Nyssa Al Ghul. Felicity caught the bouquet at the wedding. Ray Palmer has a 140 I.Q. and three doctorates. The arrows The League of Assassins uses are perfect replicas of the ones Oliver uses. Laurel refers to the events of 105 and how Oliver was accused of being The Arrow but cleared of all charges. Ray deduces that Laurel is The Black Canary based on her relationships with Oliver and Ted Grant. It is confirmed that Floyd Lawton's first target working for HIVE was Andrew Diggle. In the aftermath of the mission, Senator Cray buys the silence of the hostages and Floyd Lawton is identified as the leader of the terrorists who took Cray hostage. Lyla resigns her position with ARGUS. John is ready to quit Team Arrow but Lyla seems to talk him out of it. Ollie and John toast Floyd Lawton with Ollie's vodka. The last time they made this toast was in 311. In the end of the episode, the mayor is shot dead. The episode ends as we hear another arrow being fired as we see Maseo - in an Arrow suit - lining up a shot on Felicity. A solid send-off for The Suicide Squad and a wonderful confrontation between The Arrow and The Atom. And on a show that has become famous for its epic cliffhangers, this one may be one of the best.